See that green line? 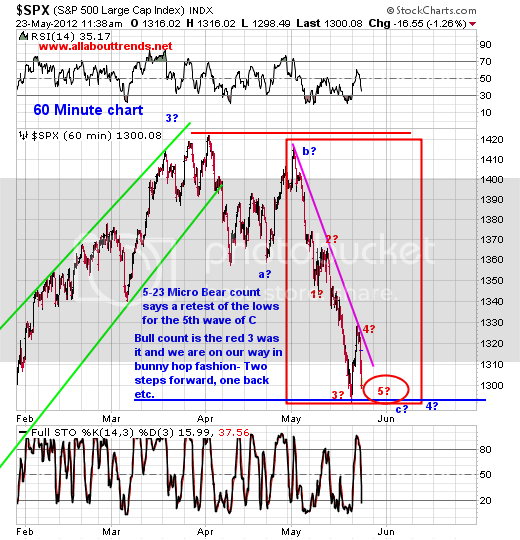 (which we’ve changed to PINK today) It’s downtrend resistance. That automatically doesn’t mean we roll over here either though, right now it’s that we just tagged a resistance level after a big short term move higher. Think digestion of those gains if we are going to work higher from here. As for the bullish and bearish counts? 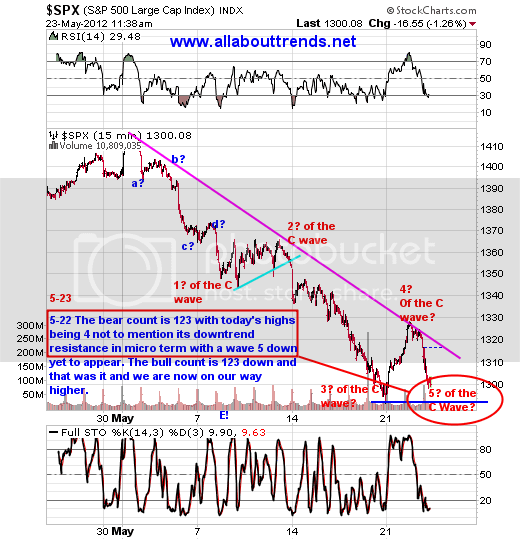 We can build a case for us being done going down, but I can also build a case for a retest of the lows for the E5 wave (as shown and mentioned yesterday in our SPX chart below). 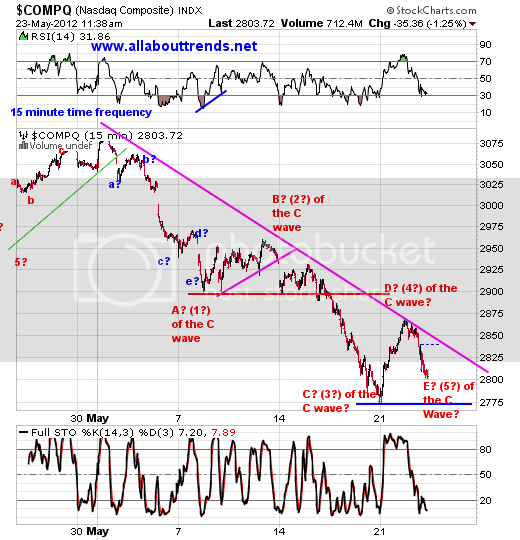 As of the open today, down trendline resistance stuck and here we are carving out wave 5 of the C wave as shown. That’s not automatically bad mind you as we’ve talked numerous times about testing testing testing and that’s about what things look like they are doing. 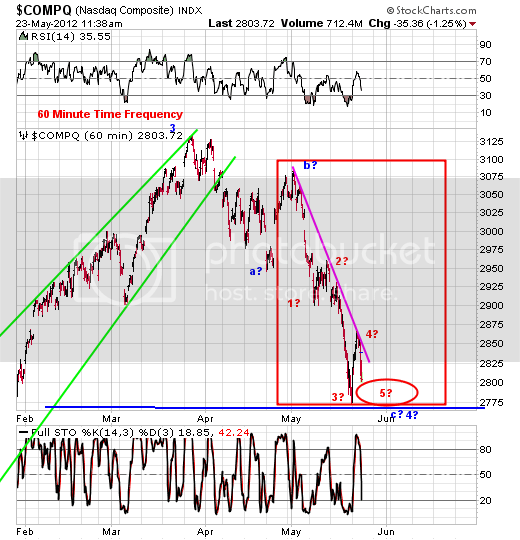 Don’t be surprised should we retest the recent lows to carve out a double bottom on the 15 minute time frequency charts. How many times have we seen this at lows and highs, where we hit a peak or low only to pull away from it and return to the scene of the crime within a few days. We’ve been here before and we’ll all be here again over the next 20 years as patterns repeat themselves because investor’s emotions never change. We were hoping we could have got at least another up day out of this bounce, but the market doesn’t care what we want or hope as it the boss not us. Moving on to the 60-minute time frequency charts it allows us to take a bigger view of this whole ABC down off the 2012 highs. So in summary? There is a good possibility that what we are seeing is the 5th down wave of the bigger C wave which is either going to be a retest of recent lows or even an undercut (Don’t forget 1292 is a support level on SPX). Now if we do hit those numbers/zones mentioned above and we chew around and take off? Then YES the C wave will have been completed. Overall when we look at our current holdings considering what’s going on out there today its really not that bad, sure we have a few issues giving us some guff and have been for a bit anyway, but with us in back to the scene of the crime retest underway for a 5th wave which is an ending wave by the way. Should we just throw in the towel on our issues giving us some guff? Its also why we use trade size risk management, it cushions those issues that give you a hard time every now and then. Besides, after all what comes after 5 waves down? Why 3 waves up of course. The following has been an excerpt from today’s premium update by All About Trends. Premium members receive daily market commentary and stock picks, a weekend wrap-up, and a concise trading plan. I personally recommend their service for their insightful content, trading methodology, and value. Try it here at a significant discount. Got the 13000 target on Dow and exited. Now getting the time and price wise correction. The next QE sets the perfect impending bull run to 14000 my second target by dec 2012. Hopefully it takes place text book style. Just wondering if we have had a major bottom in silver last week? Not sure! Any suggestions , anyone? Charts look weak but with silver you never know! Maybe a bottom. I don’t think the low in Silver is in. Maybe it could fall to somewhere between 22 and 24?